The Fed has gone dovish. In fact, it’s going to allow inflation to explode higher. That, in of itself, is significant… to understand why, we first need to acknowledge how the Fed currently operates to control risk in the financial system. 2) The Fed Funds Rate which controls the prices of “money” in the system. Regarding #1, after engaging off and on in QE for six years (2008-2014), the Fed has only been tapering QE for six months and it’s already in trouble. 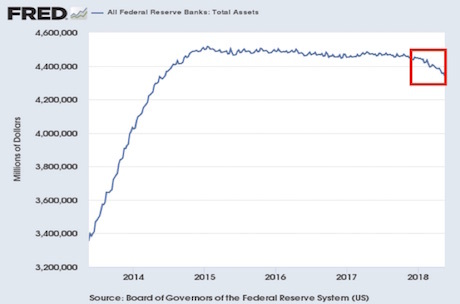 The fact the Fed is already “pumping the brakes” despite having shrunken its balance sheet a mere $126 billion (less than 3% of its gargantuan $4.3 TRILLION balance sheet) is telling. Regarding #2, the Fed has raised the Fed Funds Target rate six times from 0.15% to its current level of 1.5%-1.75%. While this DOES seem significant, it is worth noting that these are usually the levels to which the Fed CUTs rates during a recession/ crisis. Put another way, having kept the Fed Funds Target Rate at ZERO for seven years (’08-’15), even after some 2+ years of tightening, rates remain at levels that USUALLY mark EXTREMELY easy conditions. To conclude… both of the Fed’s primary tools for controlling the financial system have barely budged towards normalization… and the Fed is already going dovish. Indeed, the Fed opened the door to an inflationary “overshoot” of its 2% inflation target in last month’s FOMC release! Let me be blunt… The Fed will ALWAYS understate things because its primary role is to maintain financial stability. So if the Fed is even hinting at permitting an inflationary overshoot, it’s because the Fed knows this is unavoidable. 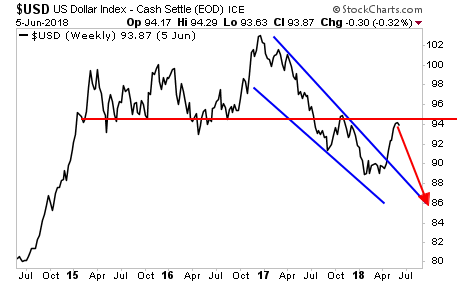 The $USD has already figured this out and is rolling over on its way to a NEW lows. And this move is going to send risk assets, especially inflation/ reflation trades THROUGH THE ROOF.